CivilServicePrep’s online program allows you to prepare for various pre-employment tests used to screen candidates for Civil Service Jobs. With access to timed-practice tests designed specifically for Civil Service Tests, you will gain the confidence and know-how to pass the recruitment written tests on your first attempt. 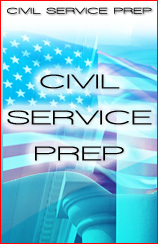 Gain the competitive advantage with CivilServicePrep! - Access for 1 year - Do the tests as often as you like! - Full Money Back Guarantee!